Some people on your holiday gift list may be hard to choose presents for. However, the stoner in your life should be pretty simple to please. While every cannabis consumer and connoisseur would love a bag of top-shelf bud, an infused edible, or a new smoking apparatus there are some other rather extraordinary and elevated stoner gifts available on the market today. From tools that will help you de-carb your cannabis and ones to help you make infused butter and oils to ones that can even help you grow your own cannabis at home the list is almost endless. 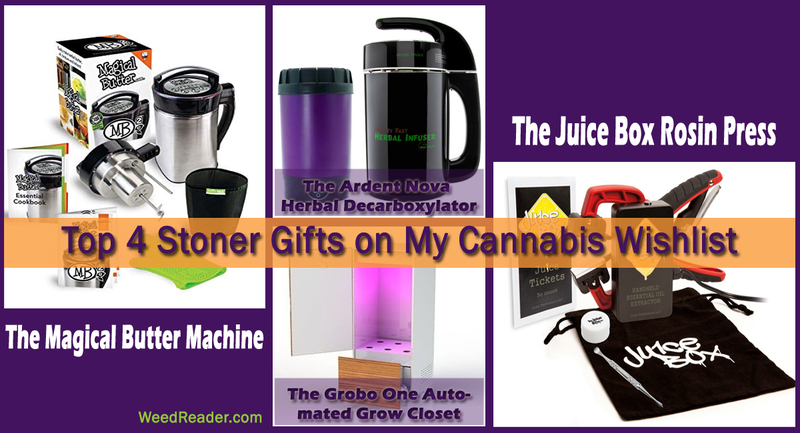 Here are five of my favorite cannabis centric gifts that will elevate the happiness of the stoner in your life this holiday season. The Magical Butter machine is well… simply magical and sure to light up the eyes of any stoner on your list. This high-tech device allows for at home cannabis chefs to easily infuse cannabis and other herbs into butter or oil of their choice. The Magical Butter Machine makes cooking with cannabis at home, as easy as adding a few ingredients and pushing a button! First, you will want to decarboxylate your cannabis though, and for that, I highly recommend the next product on our list! Learn more here! The Ardent NOVA Decarboxylator takes the guesswork out the decarb process. If you aren’t familiar with this process, check out this article. The NOVA guarantees full activation of the THC in your product without producing an odor in a clean, straightforward process. The machine offers the ability to decarb up to 1 ounce of flower. Or if you prefer, 5 ounces of kief at one time! Learn more here! For individuals lucky enough to be able to grow their own cannabis at home, an automated grow closet such as the Grobo One makes a fantastic gift. I will warn you though, this is the most expensive gift on the list with a hefty price tag. But as you will see, it is well worth it! The Grobo One is made of high-quality steel and Canadian birch wood. Its features include an ultra-efficient LED lighting system, a small, sleek design that will fit in almost any room, and full automation of the growing process. According to their website all you have to do is, “plug it in, plant your seed, select the recipe on the Grobo app and let Grobo One do the growing.” Learn more here. The Ju1ceBox rosin press makes the process of making your own cannabis concentrates at home from bud easy as possible. This small handheld extractor utilizes the idea combination of surface pressure and heat. This and precise timing intervals to ensure high yields of clean extracted oil. This process of extraction eliminates the need for dangerous solvents and hydraulic components. It also allows you to make amazing concentrates in just a few minutes! Learn more here. What is the must-have dank gift on your cannabis wish list for 2018? Let us know in the comments below!